Research by CSU and Agriculture Victoria aims to increase lentil consumption in Australia by developing new products which may also deliver health benefits to consumers and boost returns for producers. Research by Charles Sturt University (CSU) and Agriculture Victoria aims to increase lentil consumption in Australia by developing new products which may also deliver health benefits to consumers and boost returns for producers. 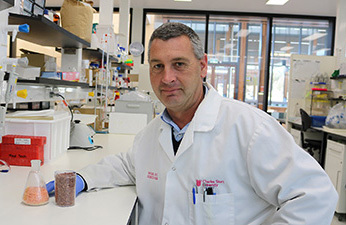 CSU PhD candidate Mr Drew Portman (pictured), from the Australian Research Council (ARC) Industrial Transformation Training Centre for Functional Grains (FGC), is examining how lentil flour can be incorporated into wheat-based foods. “Lentils are widely consumed within the Indian subcontinent and that’s where the bulk of the product grown in Australia is exported,” Mr Portman said. “Although lentils are gaining popularity as a food source in western diets, wheat is the staple grain used for manufacturing food products. 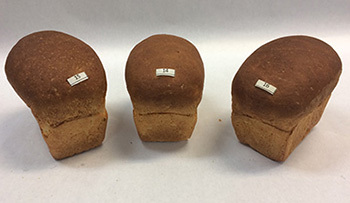 One product under investigation is bread made from a lentil and wheat flour mix. “This has the potential to make a product that most of us eat every day more nutritious,” Mr Portman said. The research is being carried out with industry partner Agriculture Victoria at the Grains Innovation Park in Horsham, Victoria, and involves testing the rheological and baking properties of flour as well as evaluating the quality of bread and its nutritional properties for potential health benefits. “The aim is to optimize the blending ratio so that the bread has the baking and eating qualities seen in traditional wheat-based products but also delivers the nutritional benefits of lentils. “Moving forward we will also be investigating how lentil and wheat flour blends can be used in the production of extruded foods such as pasta and snacks foods,” Mr Portman said. Mr Portman’s research is supervisd by FGC Director Professor Chris Blanchard , Dr Joe Panozzo from Agriculture Victoria, Professor John Mawson from Plant and Food Research in New Zealand, and Dr Mani Naiker from The Australian Catholic University. Funded by the Australian Government through the ARC’s Industrial Transformation Training Centres scheme, the FGC is administered by Charles Sturt University and is an initiative of the Graham Centre for Agricultural Innovation.